Universal Studios Theme Parks Adventure, known in Japan as Universal Studios Japan (ユニバーサル - スタジオ - 日本 Yunibāsaru sutajio tēma kōen adobenchā), is a 2001 video game developed and published by Kemco for the Nintendo GameCube. 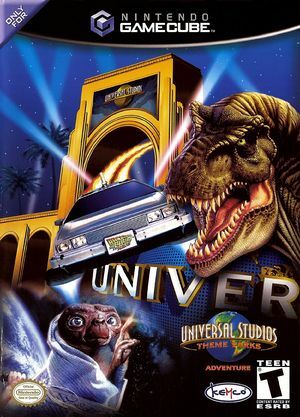 Set in a Universal Studios park, the object of the game is to complete several mini-games based on the real-life attractions Back to the Future: The Ride, Jaws, Jurassic Park River Adventure, E.T. Adventure, Backdraft, Wild, Wild, Wild West Stunt Show and Waterworld. There is also a Movie Quiz, in which you must answer trivia questions about the Universal Studios films. The graph below charts the compatibility with Universal Studios Theme Parks Adventure since Dolphin's 2.0 release, listing revisions only where a compatibility change occurred. This page was last edited on 25 July 2018, at 03:56.